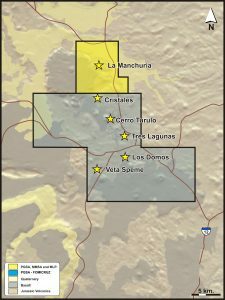 The La Manchuria project is located in the central-west of the Deseado Massif, 50km SE of the Cap Oeste deposit, in Santa Cruz province, Argentina. The 5,594 ha La Manchuria block, held 100% by Patagonia Gold S.A., is located immediately north and contiguous with, the 27,558 ha Manchuria Sur block, a JV with Fomicruz S.E where Patagonia Gold S.A. is earning 90%. Mineralisation at La Manchuria occurs within a structurally complex NW-SE striking deformation zone of steeply dipping oblique-slip faults, hosted by andesitic lavas of the Bajo Pobre Formation and dacitic and rhyolitic pyroclastic rocks of the Jurassic aged Chon Aike Formation. Silver-gold mineralisation occurs within low-sulfidation veins and veinlets of banded chalcedony, quartz and adularia displaying crustiform-colloform texture with occasional ginguro bands. Ag:Au ratio is highly variable but commonly in the range of 30:1 to 80:1 while arsenic and base metal concentrations are low. Principal veins 0.3 to 1.0m wide are hosted within a halo of veinlets 2m to 8m wide. Originally explored by Lac Minerals, commencing during 1991 and subsequently acquired by Barrick Gold Corporation during 1994 before Patagonia Gold S.A. acquired the property in February 2007. Exploration conducted to date includes geological mapping, soil geochemistry, Induced Polarisation and Ground Magnetic surveys, trenching and 149 drill holes for a total of 22,200 m.
Preliminary cyanide leach testing indicates recoveries of up to 93% Au and 85% Ag from sulphide mineralisation are achievable. The Eastern Zone of the deposit has yet to be adequately explored and the prospective corridor to the NW remains untested due to the presence of Quaternary cover sequences. 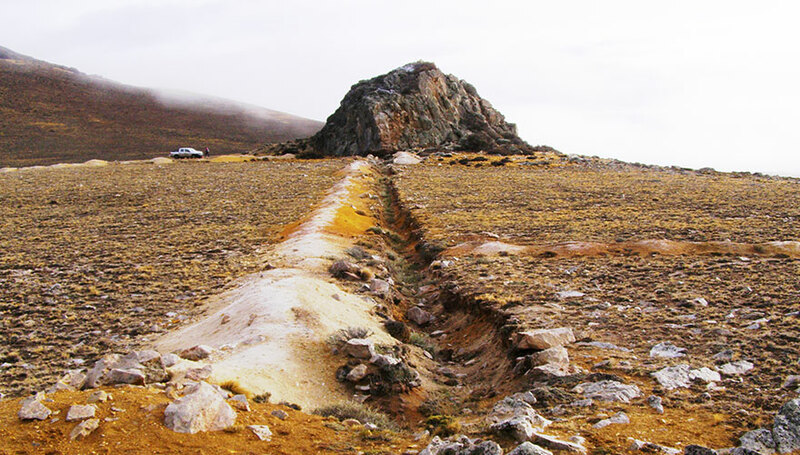 Quartz veins with elevated precious metal concentrations have been reported from poorly exposed areas up to 2km from the La Manchuria deposit. There has been no systematic exploration outside the deposit area. Cerro Turulo: Radiating silicified vein-breccias in intensely agillic-phyllic altered hydrothermal breccias. Extends NW under basalt. Very strongly elevated Au-Ag-As-Pb-Sb-Te-Se. Central zone of an >8 km NW-SE striking corridor. Au in rock chip to 14.4 ppm. Tres Lagunas: A 700 m long strike continuation of the Cerro Turulo structural corridor with low-sulfidation veining and best result of 2.0 m at 4.4 ppm Au and 175 ppm Ag in a sawn channel sample. Veta Speme: A 3 km long NNW striking structure with fine anastomosing quartz veinlets and breccias hosted by rhyolitic tuff. Sawn channel samples to 9.0 ppm Au and 344 ppm Ag.